There are few things better than waking up to the smell of pancakes. But when you’re trying to get fit and healthy, pancakes are rarely on the menu — right? Wrong. These Gingerbread Protein Pancakes are light and fluffy, but thanks to the addition of whey protein, they also pack a high-protein punch. And since they’re made without wheat, they’re gluten-friendly, too! The spice mix of cinnamon, ginger, cloves, and nutmeg creates more than you’ll use in the pancake batter, but you can save it in an airtight container and use it on top of oatmeal or in a Shakeology smoothie to infuse it with that classic gingerbread flavor. 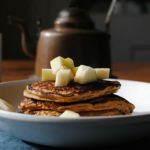 These Gingerbread Protein Pancakes are light and fluffy, and thanks to whey protein they pack a high-protein punch. And since they’re made without wheat, they’re gluten-friendly, too. To make spice mix, combine cinnamon, ginger, cloves, and nutmeg in a small bowl; mix well. Set aside. Combine protein powder, yogurt, egg whites, oats, coconut flour, 1 tsp. spice mix, baking powder, and molasses in a medium bowl; mix well. Heat large nonstick skillet lightly coated with spray over medium heat. Ladle about ¼ cup batter for each pancake; cook for 2 to 3 minutes, or until bubbles form on top. Flip. Cook for 1 to 2 minutes, or until golden brown and cooked through. Serve two pancakes topped with pear, if desired, serve immediately. Remaining spice mix can be stored in an airtight container and used in oatmeal, yogurt, or tea. Leftover pancakes can be reheated in a toaster oven.